Crunchy, soggy, with ketchup, vinegar or gravy. Andrew Webb dips into the history of chips and asks: what sauce do you have on yours? The potato arrived in Europe in the late sixteenth century, and it’s fair to speculate that once we’d all got over the fear of it causing leprosy, we tried various ways of boiling, roasting, mashing and frying it. The first hint at a recipe for something like chips however comes 60 odd years later in ‘The Acomplished Cook’ (1660) as an accompaniment to small roast fowl. The description reads ‘potato's boil'd and fried in butter’ (interesting the next line is ‘some balls made of parmisan [sic]... dipped in butter, and fried’, so we were eating parmesan with our early chips). Later recipes call for potatoes to be peeled rather as you would an apple, the resulting ribbons being fried in oil or butter. The Oxford English Dictionary states Charles Dickens gave us the earliest recorded usage of ‘chips’ in 'A Tale of Two Cities', published in 1859. 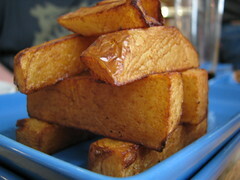 They're described as ‘husky chips of potatoes, fried with some reluctant drops of oil’. Potatoes were by then the fuel that powered the human cogs and gaskets of the Industrial Revolution, and the hub of that revolution was the North West of England. Indeed, so sure are they that chips were invented in Lancashire, Oldham council have even put up a plaque in Tommyfield Market stating: 'The first chips were fried in Oldham around 1860 from which the origins of fish and chip shops and the ‘fast food’ industries can be traced’. It's a bold claim from a boomtown of the period. Unlike bread, eggs and meat, potatoes (and fish) remained firmly off the ration book during both World Wars. Churchill's government obviously not only recognised just how much they were loved by the working classes, but also how fish and chip shops performed a similar role to the 'National Kitchens' which were set up during the war to ensure the population got some basic nutrition – and, no doubt, a boost to morale as well. Its potential as a gourmet experience, however, was obviously overlooked. As John K. Walton writes in 'Fish and Chips and the British Working Class, 1870-1940', which takes a close look at both the dish and the trade, 'fish and chips became ubiquitous, mundane, inescapable and taken for granted in Britain in the first half of the twentieth century'. So fish and chips become so much a part of the British way of life that they were just there, as representative of our cultural identity as beer and grumbling about the weather. Then, as part of the revival of the food of our grandparents of the early 1990s (think lamb shanks, pies and jellied eels), coupled with the celebration of everything working class – think Oasis and the 'mockneys' of Britpop – the fish supper took its place in the pantheon of rediscovered British classics. It was only a matter of time before they went upmarket, and thus the jenga chip was born and served in gastropubs and restaurants up and down the land. 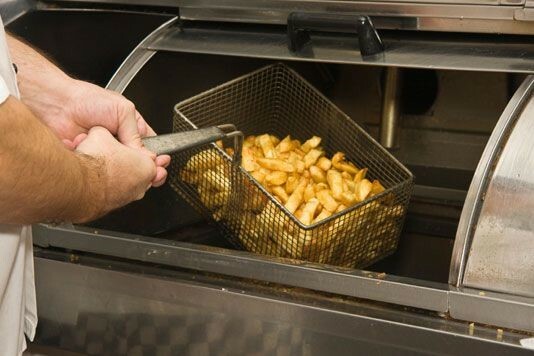 Chips are no longer loyal to just fish, they’ve gone on to strengthen partnerships with other ingredients like steaks, and burgers, in the form of fries. The chip then is the great all rounder. You can doll them up for a night out in a posh restaurant as pommes frites, or you can have them with a kebab to soak up the booze. Only one question remains. What sauce do you put on them?